Ecological thresholds occur when external factors, positive feedbacks, or nonlinear instabilities in a system cause changes to propagate in a domino-like fashion that are potentially irreversible. 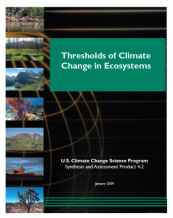 This report reviews threshold changes in North American ecosystems that are potentially induced by climatic change and addresses the significant challenges these threshold crossings impose on resource and land managers. Sudden changes to ecosystems and the goods and services they provide are not well understood, but they are extremely important if natural resource managers are to succeed in developing adaptation strategies in a changing world. The report provides an overview of what is known about ecological thresholds and where they are likely to occur. It also identifies those areas where research is most needed to improve knowledge and understand the uncertainties regarding them. The report suggests a suite of potential actions that land and resource managers could use to improve the likelihood of success for the resources they manage, even under conditions of incomplete understanding of what drives thresholds of change and when changes will occur. Key examples of climate-induced threshold changes are presented. This synthesis effort identified a suite of potential actions that, taken together or separately, can begin to improve the understanding of thresholds and increase the likelihood of success in developing management and adaptation strategies in a changing climate, before, during, and after thresholds are crossed. In general, it is essential to increase the resilience of ecosystems and thus to slow or prevent the crossing of thresholds; to identify early warning signals of impending threshold changes; and to employ adaptive management strategies to deal with new conditions, new successional trajectories, and new combinations of species.